(Left) Annakut denoting the Giri Govardhan Hill was beautifully decorated, made with many kind of sweet dishes resembling rocks, trees, and grass. Gaudiya Vaishnava Association (GVA) is a nonprofit spiritual organization founded by His Divine Grace Bhakti Swarup Tirtha Maharaj. GVA conducts various programs throughout the year in the Atlanta area to promote peace, harmony, and spiritual betterment of the community under the spiritual guidance of His Divine Grace. The 2013 Fall Festival commenced with Deepavali & Govardhan puja celebrations and came to a completion with the Johns Creek Ratha Yatra and Gita Jayanti celebrations. Deepavali (Diwali) celebrates the victory of good over evil: it marks the killing of the demon Narakasura by Lord Shri Krishna, as well as the return of Lord Shri Rama to Ayodhya after the war with Ravana. Rows of lamps are lit in the streets to receive the Lord. On November 3rd, GVA celebrated Deepavali, the festival of lights. Children made rangoli decorations and lit diyas around the altar. A variety of sumptuous prasadam was served to everyone who attended the program. Later in the evening splendorous fireworks were enjoyed in spite of the cold weather. November 4th was another important auspicious day for all Hindus. The King of Heavens, Indra, out of his wrath and envy towards Lord Shri Krishna, ordered the Samvartaka to inundate the village of Vrindavan with incessant downpours, thunderstorm, and lightning. To teach Indra a lesson, Lord Shri Krishna protected all the citizens under the Govardhan Hill by lifting the hill with His little finger for seven days. Indra finally accepted the supremacy of the Lord, offered his obeisances, and begged for forgiveness. This glorious day is celebrated as Govardhan Puja. GVA members prepared a big annakut to denote the Giri Govardhan Hill and beautifully decorated it with many kind of sweet dishes resembling rocks, trees, and grass. It was astounding to see a mini replica of the hill at Vrindavan Dhama brought before our eyes. Everyone enjoyed the sweet treats distributed during these celebrations. 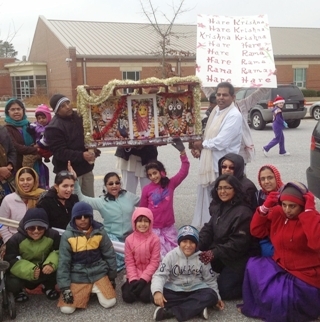 GVA organized the 4th Annual Ratha Yatra on December 7th as part of The Johns Creek Founders Day Parade. Lord Shri Jagannatha, Shrimati Subhadra devi, and Lord Shri Baladeva were carried on a decorated palanquin through the parade route. Cold weather did not stop people from attending and getting the blessings of the Lord of the Universe. The GVA youth team held banners and danced while others sang. Johns Creek city mayor Mr. Mike Bodker thanked GVA, the only Indian organization to participate in the parade 4 times in a row. Last but not least, GVA observed the Advent of Bhagavat Gita on the 12th of December. More than 5000 years ago Lord Shri Krishna spoke this great scripture, the Bhagavat Gita, to his disciple friend Shri Arjuna in the battlefield of Kurukshetra. This day is celebrated as Gita Jayanti. GVA members along with guests read the verses from Shri Bhagavat Gita and listened to discourses given by His Divine Grace B.S. Tirtha Maharaj. Ecstatic Hari nama kirtans filled the air, and tasty dinner prasadam was offered to everyone. For information on GVA's home programs including Shri Bhagavat Gita reading and Hari nama sankirtana in and around the Atlanta area, in addition to the weekly satsang in Alpharetta, please call 1-888-9GVA-USA.